Aussie Miracle Moist Conditioner: this is actually something I have been using for around 10 years now! I do dabble in other hair care brands but I always come back to my trusty and lush smelling Aussie. The miracle moist keeps my hair super hydrated, really shiny and the scent lasts all day! I also find that I don't need to wash my hair as often after using this. Another massive plus is that its under a fiver!! Will be repurchasing pronto. Dermalogica Daily Microfoliant: I can see why this product has won awards, its great! The powder, made up of Papain, Salicylic Acid and Rice Enzymes, is activated with water and works to smooth the skin and accelerate cell renewal. I received mine as a sample in a beauty box subscription and I thoroughly enjoyed using it instead of those harsh grainy exfoliants that leave your skin red raw and stripped of life! I don't think I will be purchasing this just though though as the full size is a whopping £27.95 and I'm not sure if it is really worth that price tag. Bobbi Brown Creamy Concealer: When I bought this I was head of over heels for it, nothing I had used had come close and it really concealed everything so well. Then suddenly I decided it was too thick and I didn't love it so much anymore. I think the reason was I was using much lighter foundations and my skin has been quite behaved, so thick concealer wasn't necessary any more I also discovered Maybellines Dream Lumi concealer which is my new addiction. Bobbi you have been so good to me but I won't be repurchasing you right now. Chantecaille Just Skin Tinted Moisturiser: I have really been embracing the "no make-up make-up look" for a while now and I have not stopped using my Just Skin. This is by far the best tinted moisturiser I have ever used and I am devastated that I have finally ran out! This got me through a summer, autumn and winter and I used my last little blob a few days ago *cries*. Just Skin leaves you looking absolutely glowing and dewy whilst giving you remarkable coverage but still being really light and breathable. The only thing I hate about this is the price - £57 is extortionate for an item of make-up I don't care what anyone says its a ridiculous price tag! For that reason I simply can't repurchase it right now, however much I want to, but I've decided it's a chance for me to try out some different foundations and hopefully end my quest to find a dupe for this amazing product!!! It's farewell for now Chantecaille Bioderma Crealine: Bioderma is probably my most used product of all time. I use it every single day without fail to remove eye make-up cleanse or to simply freshen up. I am so so glad I found micellar waters in 2012 as they have changed the way I treat my skin and make-up wipes/foaming face washes have become a thing of the past. Its one of the only cleansers that doesn't leave my skin red and patchy its so gentle, but it removes every last trace of make-up. Its really difficult to get hold of for a reasonable price in the UK, I stocked up when I was in Paris and got 2 bottles for about £12 which is a bargain! I know there are sellers on Amazon and Ebay but I personally wouldn't recommend getting this from there. I've heard that Bioderma will soon be available in Boots which would be AMAZING, but I hope it comes with a friendly price tag. So there are my empties! I actually really enjoyed using up some products for a change and I will be attempting to stick to this new rule if mine in future! Especially as it now means I can go out and buy more, he he!! 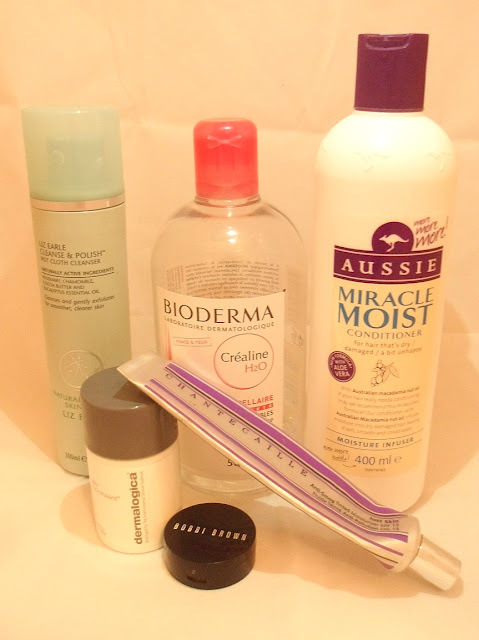 Have you done an empties post I can have a read of??? Im still yet to try bioderma but as its becoming avaliable in the UK soon I may finally get around to it! I've heard good things about that tinted moisturiser, if only I could justify the price! Just skin sounds fab - I don't mind payng for quality but I wish I could try it before committing to full size. What's up, constantly i used to check weblog posts here early in the dawn, as i love to find out more and more.